Snow leopards are one of the top predators in the high mountain food web of Central Asia. The snow leopard is an opportunistic predator capable of killing prey three times its weight. Snow leopards in the Himalaya and Tibet eat blue sheep (bharal). 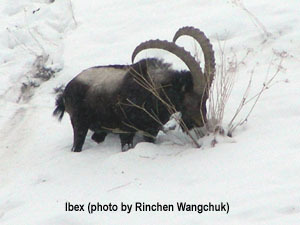 Snow leopards that live in the Karakorum, Tien Shan, Mongolian and Russian mountain ranges eat ibex (Capra sibirica). Blue sheep and ibex are the snow leopards favorite meal, but they also eat small prey such as marmots, pika, hares and birds. Dr. Rodney Jackson has reported that the annual prey consumption of a snow leopard in India’s Hemis National Park is 5 blue sheep, 9 Tibetan woolly hares, 25 marmots, 5 domestic goats, 1 domestic sheep and 15 birds. Snow leopards help to keep the ecosystem in balance by preying on Himalayan marmot populations. Marmots are important to the alpine pastureland because their burrowing, much like plowing, aerates the soil and helps the grasses grow. The grasses are important to the wild sheep and goats (which are also snow leopard prey) and also to the livestock that mountain people depend upon for their existence. However, marmots also eat vegetation, and they have periodic population explosions. Too many marmots, eating too many grasses and shrubs, will degrade the alpine meadows. By preying on the wild sheep and goats, snow leopards also help to keep the meadows healthy. Overgrazing by too many marmots, like overgrazing by too many ungulates, kills the grass and shrubs. If predators are removed the grassland could disappear causing the wild ungulates (ungulates are hoofed animals) and marmots to disappear. Then the butterflies and other insects that pollinate the meadows and the barley and potatoes that people eat would also disappear. This is an example of the domino effect in nature. All these factors tell us that snow leopards are not only a beautiful symbol of the high mountains of Central Asia, they are an indicator species. Where they are healthy we can expect to find a healthy ecosystem. Where they are struggling we can expect to find the whole web of life on shaky ground.